Connecting your social media accounts with Neo4j is perhaps one of the most exciting ways to visualize your social data. After all, it’s a great experience to look at the relationships between your liked pages on Facebook or your entire Twitter history and see them all as an interactive graph where you can click and explore each node for more related information. So, how can you take part in this ultimate social data adventure? In this post, I’ll introduce a simple approach to visualize your Facebook data as an interactive graph. Go to Facebook Developers and use the Graph API Explorer to generate an access token, after you give the appropriate permissions. Create a new asp.net website within Visual Studio in C#. Next, add the following namespaces after the installation of the Neo4j Client in your application. These enable the capabilities of the Cypher query language with Microsoft C# and they also add the Facebook SDK. Here’s a simple Cypher query you can use as an example. Feel free to write a different query according to your requirements. 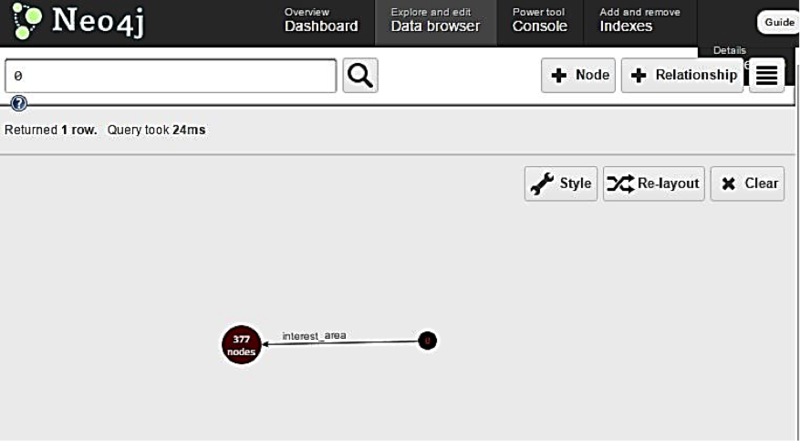 This query displays a graph in which a user and their liked categories are all nodes and the user’s interest areas are the relationships. .Where( "x.Username='" + facebookUser.Username + "' and	y.Category_name='"
Now just click on the nodes and explore your social graph. Have fun! For more on graphing your social data, read my full paper A Practical Approach to Process Streaming Data using Graph Database published in the International Journal of Computer Applications. Register for this week’s webinar on 30 July 2015 at 9:00 a.m. Pacific (18:00 CEST) to master the different procedures and tools for a smooth data import process for Neo4j with Senior Engineer, Mark Needham. Mukul Sharma is a community contributor to the Neo4j blog. He is a research scholar in the Department of Computer Science & Engineering at Sri Balaji College of Engineering and Technology in Jaipur, India.